Discussion in 'Defence Analysis' started by Hellfire, May 15, 2017. SrNair, lca-fan, Lion of Rajputana and 4 others like this. These two groups were divided by a compact group of Brahoi Tribes which occupied the area of Kalat. They spoke the Barhoi or the Kirdgali language, while the two main groups spoke the Baloch Language in distinct but mutually intelligible dialects. 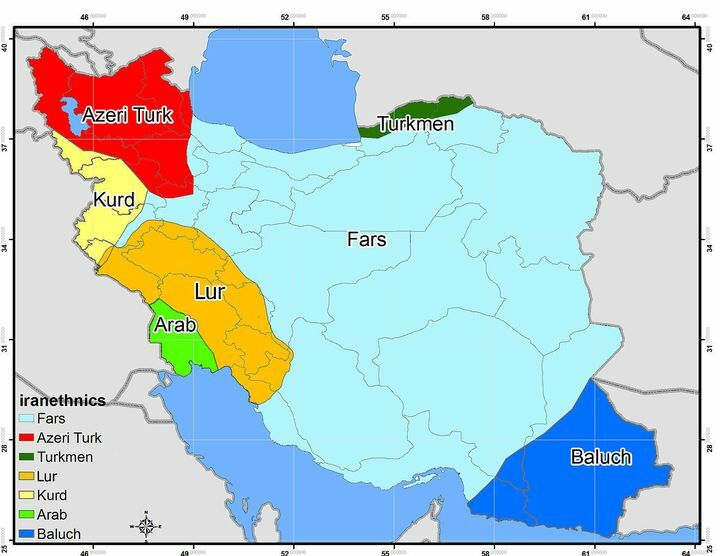 It is pertinent to note that the Suleimani Balochs are those that are found in the majority of provinces of the modern day Pakistan and it's provinces, namely Sindh, Punjab, while the Mekrani Balochs are those that inhabited the general area of Sistan. The region was a part of the Achaemenid Persian Empire and then various Persian and Indian empires and local kingdoms and was presumably inhabited by some mix of Iranian and Indian people. People in Balochistan followed Hinduism, Buddhism, and Zoroastrianism. The region acquired a notorious reputation due to Alexander the Great disastrously marching back to Babylon after his Indian campaign through it's deserts, leading to the deaths of thousands of soldiers. In the 11th century, the Seljuk Tribes invaded Persia. This is thought to have stimulated the eastward migration of the nomadic tribes (ancestors of today’s Baloch) of central Iran and the area south of the Caspian sea into Balochistan. As these tribes were used to living marginally in arid territory, the move to the even more arid Balochistan was not a catastrophe and was indeed a path of less resistance than fighting the invaders, who competed for the same pasture space in Iran. Around the same time, Balochistan’s largest minority group, the Brahui (who speak a Dravidian language like other South Indian languages) migrated to Balochistan from central India and formed a symbiotic relationship with the Baloch. Many Baloch become sedentary during this period, farming oases. They formed many kingdoms and tribal confederations, sometimes independent, sometimes under the suzerainty of external empires. In the 1500s, Balochistan like Afghanistan to its north, became divided into zones of control between the Safavid Persian Empire to its west and the Mughal Empire to its east. This approximately reflects the Iran-Pakistan border today. Because Persia’s Sistan province is a frontier province, it was loosely controlled and its people had leverage over its central government (they could swear allegiance to the Mughals if they wished). As a result, unlike most of the rest of Iran, it managed to escape the central government’s policy of implementing Shia Islam. As for the Mughals, while initially they ruled Balochistan directly from Multan in the Punjab (in today’s Pakistan), it was never a place of much importance. Control was delegated to a local vassal who organized the Khanate of Kalat in 1666 (located in central Balochistan). On behalf of the Mughals, Kalat ruled over the vassals of the states of Las Bela, Kharan & Makran, which make up most of Pakistani Balochistan. In 1783, the Khan of Kalat granted suzerainty to the port of Gwadar to a man who later became the Sultan of Oman and who decided to keep it as part of his domains. Pakistan had to buy it back from Oman in 1958. The division of Balochistan into western and eastern halves temporary lapsed during the 18th century as first the Safavid and then the Mughal Empire, and finally the brief empire of Nader Shah collapsed. 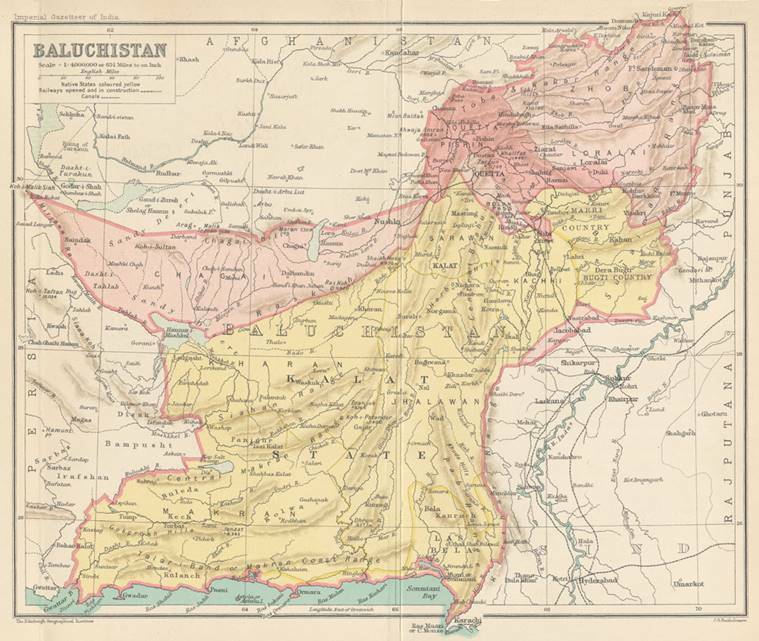 Balochistan reverted to a collection of principalities, some of which then fell under the control of Afghanistan, but most remained independent. The most important of these independent principalities was Kalat. Within a century, though, the Qajar dynasty established itself in Persia, and the British in India, squeezing the Baloch again. The British attacked Kalat in 1839 as part of their related invasion of Afghanistan, installing a friendly ruler. In 1854, Kalat became an associated state of the British, and in 1877 the British established the 'Balochistan Agency' to deal with the Baloch princely states in its Indian Empire and directly rule of the northern half of Balochistan, including Quetta. Under the British, Balochistan was divided into three parts by successive lines. The Goldsmid Line, drawn in 1871 and demarcated in 1896, gave western Balochistan to Persia. The Baloch in Iran, however, maintained their independence until 1928 when, with British approval, Reza Shah Pahlavi occupied and forcefully annexed western Baluchistan into Iran. The Durand Line, drawn also by the British in 1894, further divided eastern Baluchistan between British India and Afghanistan. Upon the British withdrawal from the Indian subcontinent in 1948, Baluchistan regained its independence for a short time but was invaded and annexed by Pakistan the same year. Pakistan, which absorbed the princely state of Kalat in 1955 (it is believed that Kalat had tried to find a way to join India instead), reconfirmed this boundary with Iran with some very minor changes during a demarcation in 1958-1959.